During more than two months, the NZD/USD pair has been moving within the broad sideways trend. In early March, quotes rose significantly and reached the upper border of the channel at the level of 0.6940. The price failed to break it, lost about 200 points in a few days and returned to the local lows of mid-February and early March at the level of 0.6745. Now, the instrument has consolidated above it and is trading within a narrow sideways consolidation. Ambiguous releases in the United States and New Zealand were the main catalysts for this movement. NZD cannot gain strength due to excessively soft monetary policy and a decline in investor interest at key resistance levels due to the closing of profitable long positions and the growth of the volume of short positions. At the end of the trading week, investors expect a number of key US releases, which can give an impetus to the breakdown of the lower border of the sideways channel and the change of trend to the downward one. Traders will focus on the labor market data: the Unemployment Rate and Nonfarm Payrolls. In the medium term, the breakdown of the lower border of the current channel and the formation of a downward impulse are predicted. On the 4-hour chart, technical indicators confirm the decline forecast: the volumes of MACD short positions significantly increase, Bollinger bands reversed downwards. Resistance levels: 0.6790, 0.6825, 0.6850, 0.6870, 0.6905, 0.6940, 0.7000. Support levels: 0.6770, 0.6745, 0.6700, 0.6600, 0.6570, 0.6500, 0.6420. 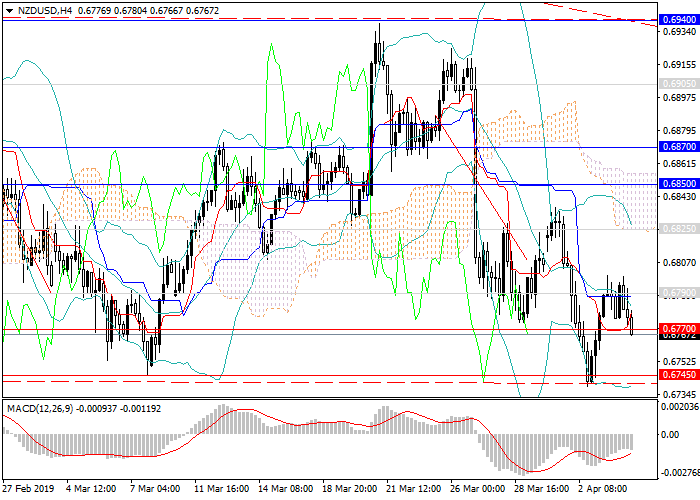 It is better to open positions below 0.6745 with the targets at 0.6600, 0.6500, 0.6420 and stop loss 0.6800.